Nara, the ancient capital of Japan is best known for its temples more than anything else. Most visitors come here to pay homage to the great 大仏 daibutsu (Buddha) of Todai-ji and have fun at Nara deer park. If you wish to move away from the crowd and experience Nara’s wild beauty, you should hike up the most iconic natural beauty of this city, the lush green mountain called 若草山 Wakakusayama. Wakakusayama is also known as 三笠山 Mikasayama because the three round green overlapping ranges look like three bamboo rain hats (笠). Situated 4.6 kms from Kintetsu Nara station, Wakakusayama is 342 m high and relatively easy to hike. The summit can be reached in 40 mins and I must say you can get the best bird’s eye view of Nara city from here. 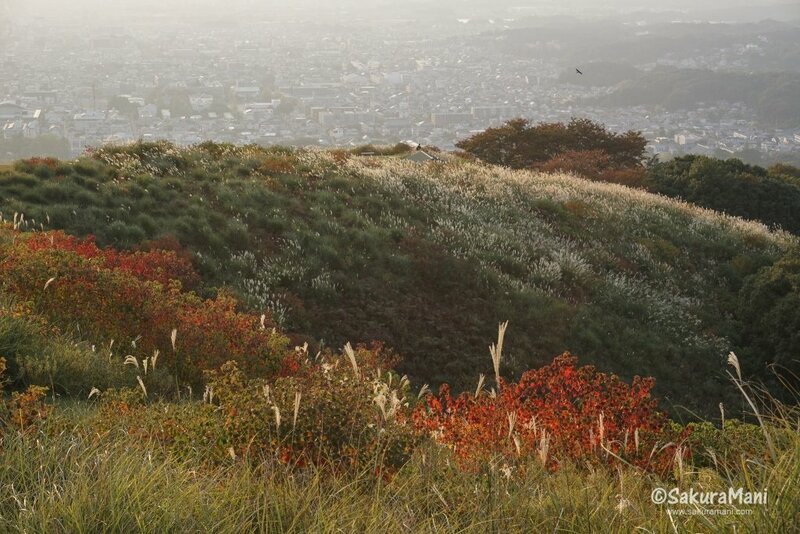 What’s more interesting is that the mountain changes its color with change in seasons. As the name suggests, Wakakusayama is carpeted by short green grass which makes it look like a lawn. Summer is the best time to see this classic look. You will also find agile deer herds cheerfully nibbling the fresh young grass. 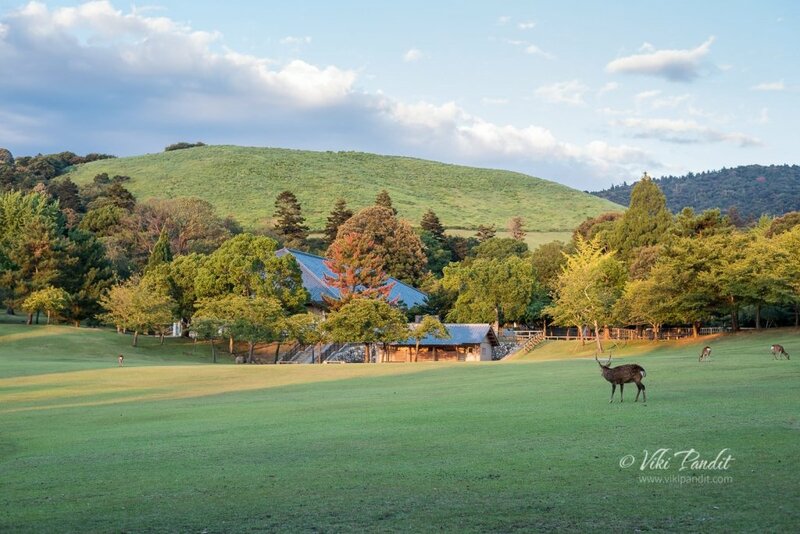 Although summers can be extremely exhausting in Nara, spending an evening at Wakakusayama is not a bad idea. Make sure to keep yourself hydrated on the hike. Autumn sets in, painting the 紅葉 maple trees red, orange and yellow. Japan looks like a pretty young maid clad in a blazing red kimono. There are numerous spot where you can find rows of 紅葉 momiji or maple leaves. Along the hiking trail at Wakakusayama you can find clusters of pampas grass dancing away in the cool autumn breeze. I hiked Wakakusayama during this time of the year. While ascending I took a break at the second summit to catch some breath and looked up only to be dazzled by the white cottony nimbus clouds floating across the bright blue sky. Winter could have been a dull season at Wakakusayama since the grass dries up making the mountain look pretty much barren. Nevertheless, Wakakusayama is again brought to life by 山焼き yamayaki festival that takes place every year on the fourth Saturday of January. The history of this event dates back to 1760 when Wakakusayama was set ablaze to put an end to the boundary dispute between 興福寺 Kofuku-ji and 東大寺 Todai-ji. However, according to another popular explanation, this event is being held since centuries to drive away wild boars and pests. Yamayaki starts off with small events like 煎餅 sembei (rice cracker) throwing competition. Priest from Kofuku-ji, Todai-ji and Kasuga-taisha come together to take part in yamayaki. The torch which is used to set Wakakusayama on fire is carried down from Kasuga-taisha by monks. 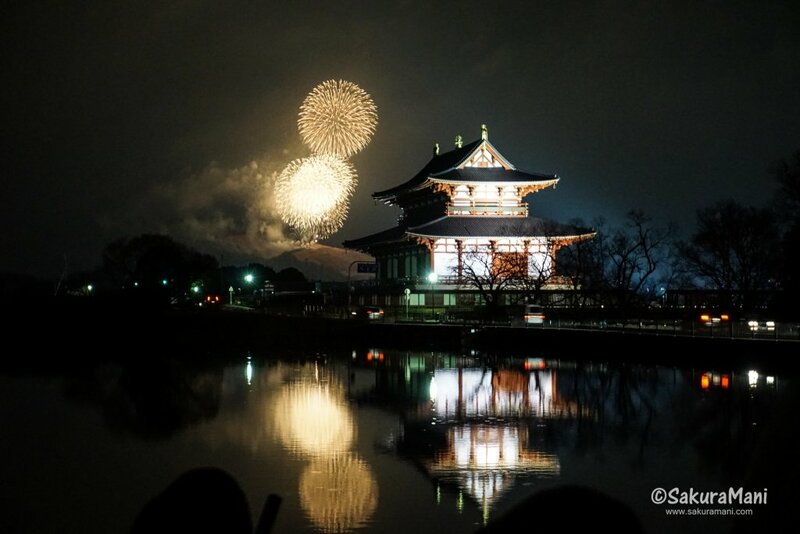 Before yamayaki is performed there is a grand display of fireworks for almost 30 minutes. Spring is the most celebrated season in Japan. The main attraction during this time is nothing other than 桜 sakura (cherry blossoms). There is a line of sakura trees along the hiking path and along the fence. 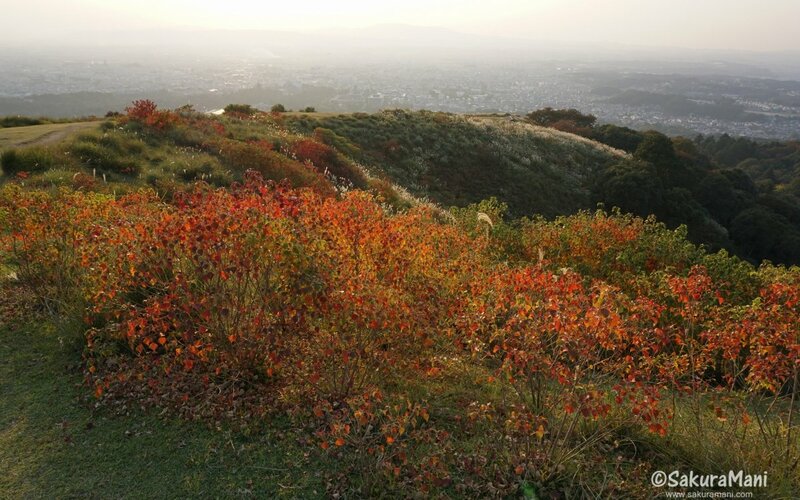 Nara usually experiences cosy weather with occasional cool breeze during spring. New grasses start appearing now. Though the mountain does not look as green as it looks in summer you will always find the deer having quite a feast here (they love sakura flowers). 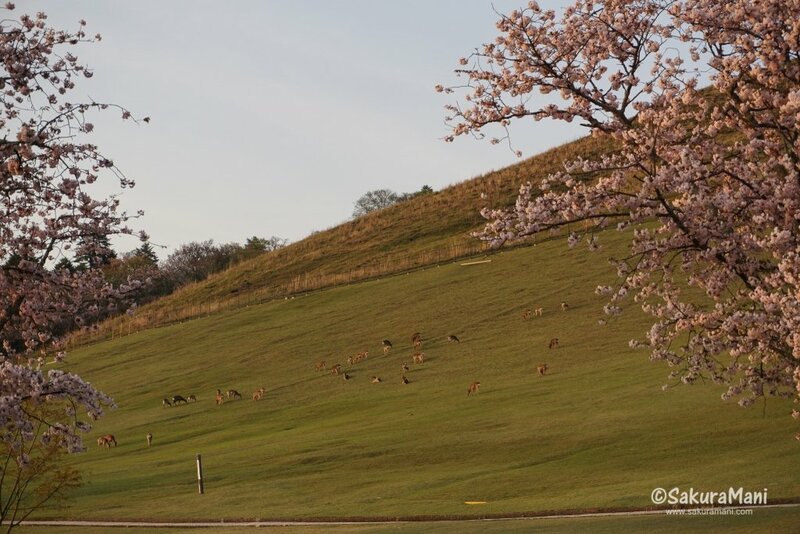 If you are planning to travel to Nara during this time, do visit Wakakusayama to enjoy sakura, green meadows and the lovely deer.